In his bestselling CD, Dr. David Friedman shares the secret to attaining optimal health. 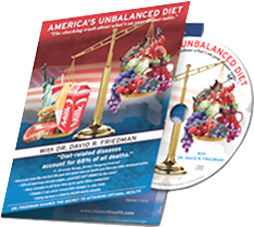 “America’s Unbalanced Diet” exposes shocking evidence that will enlighten you and forever change the way you look at the items on your dinner table. Diet- related diseases account for 68% of all deaths! What ingredient in most people’s kitchen is a major cause of obesity? Which vitamins can cause irreversible damage to your body and even DEATH! Diet soft drinks cause you to gain weight. Milk is a primary cause of brittle bones. Learn this and more in this powerful bestselling audio CD, “America’s Unbalanced Diet” with over 1 million copies sold!"